Drive Growth & Create Savings. Our proven strategies drive growth and create saving by supplementing or outsourcing circulation, newsstand or data. Whether it's growing your audience through email, direct mail, social, 3rd party partners, expire or retail marketing, we have the solutions you need. We have deep experience in consumer response through all channels; mail, digital, experiential and the retail marketplace. Finding the right consumer with the most effective response drives our planning and marketing. We actively challenge the norm in the retail marketplace by examining the channel though a different lens, where “status quo” no longer prevails. With a focus on the future, continuing to operate under old metrics is no longer valid. Our experience, real-time data & proprietary scoring algorithms help us customize each customer journey effectively and less expensive than the larger data management companies. Optimize your acquisition funnel and ROI. Monetize your assets by bundling them into unique premium-priced subscription programs. Bundle & Monetize Your Assets. Bundle a brand's assets to build unique, premium-priced subscription programs for enthusiasts. Many assets are siloed in print, digital, video, experiential, archives, etc. but few have been bundled, generating a new, organic revenue stream. We have the experience, expertise and the platform to integrate all aspects of your brand. We offer end-to-end expertise based on best practices from our real-world experience to scope out, design, launch and manage premium-price membership programs. Our workflow and systems are designed to minimally impact your day-to-day while maximizing ROI. We work with brands, both big and small, to help identify current assets and build out their value proposition by bundling these benefits and offering to their most loyal customers. Talk to us today about how we can help further monetize your existing assets. By bundling your brand's assets for your most loyal customers and applying our proven acquisition & retention strategies tailored to the unique needs of these programs, we create the 'holy grail' of consumer marketing; new, recurring & organic revenue streams. 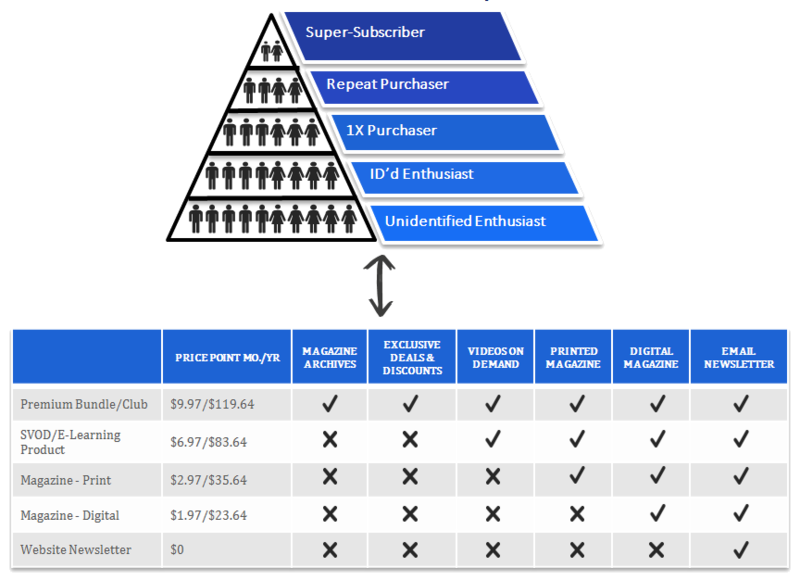 Streamline all subscription offerings into a logical hierarchy, deploying a single marketing budget that maximizes consumer ROI and LTV. This strategy allows brands to consolidate customer service touch points to allow for automated up-selling and down-selling, creating frictionless transactions through establishing a single credit card-on-file. As a byproduct, the ecosystem encourages offline-to-online payment migration across all consumer relationships. Optimize your campaigns by leveraging name-scoring & advanced segmentation to email & print campaign execution. We optimize current subscription revenue streams. Through the combination of scoring algorithms and marketing know-how, we help clients optimize revenue streams through individualized pricing of new business, conversions, renewals & gift campaigns. We have data expertise to manage marketing campaigns for maximum ROI. Name segmentation & scoring to the measurement of test matrices help us offer a truly optimized acquisition funnel. Real-time data helps us customize each customer journey, more effectively and less expensive than the larger data management companies. We combine our proprietary scoring algorithms and marketing know-how to optimize your current subscription revenue streams. Customize the customer journey in real-time, making your marketing more effective and less expensive than working with the larger data management companies. We have the data expertise to effectively apply name segmentation & scoring to the measurement of test matrices, creating a truly optimized acquisition funnel. Create once, publish anywhere! Coordinate content development, digital rights & labor costs across an enterprise. 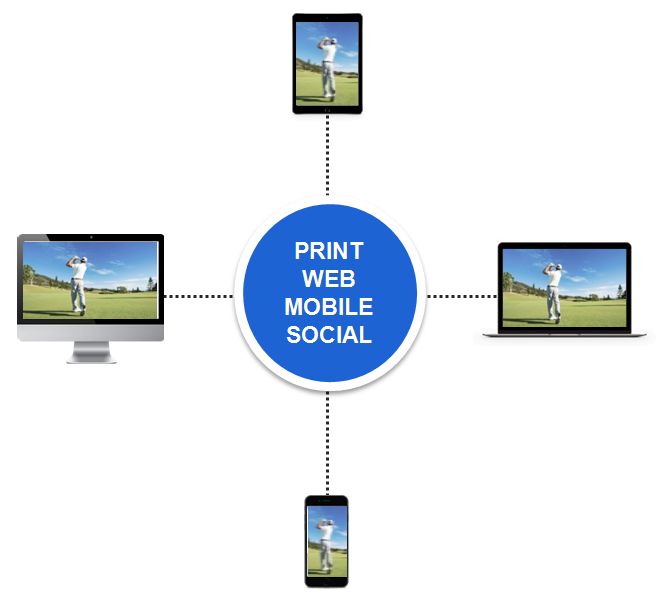 Our proven strategy for workflow design delivers efficient, true multi-platform publishing with a focus on digital first and curating the best for print. Our web-based application supports this strategy by allowing an enterprise to coordinate content development, digital rights and labor costs of content in a unified interface. Coordinating content development, schedules & cost. Imagine being able to track integrated advertising campaigns, giving you the ability to manage multiple, complex deliverables for clients on all platforms...it's simple to track multiple-format projects for large, single clients. Similar to the content benefits, you can generate ideas across groups, schedule and track all projects, create cost estimates and track P&L's for each deliverable and the overall client.